A few years ago, California started an ambitious program to charge polluters for the climate-changing greenhouse gases they put into our air, and then use that money to promote clean energy and energy savings while bringing the benefits of this growing clean energy economy to our most polluted and economically struggling communities. The California Department of Finance must submit an annual report to the legislature on the status and outcomes of projects funded by the money polluters pay into the Greenhouse Gas Reduction Fund. The 2017 Annual Report lists the projects funded by the GGRF and describes their status. It also provides estimates of the greenhouse gas reductions expected from project investments and provides key statistics on benefits to disadvantaged communities. The report provides fiscal data as of November 30, 2016. NUMBER ONE: CALIFORNIA’S CLIMATE POLICIES, INCLUDING THE POLLUTERS-PAY PROGRAM, HAVE THE PRIMARY GOAL OF REDUCING POLLUTION, NOT GENERATING REVENUE. Ok. That one is not specifically in the report but it’s an important point. If we reduced pollution, particularly in the most impacted communities, and reached our climate goals without generating revenue, we would love that. Since 2006, when the groundbreaking Global Warming Solutions Act (AB 32, Núñez) put California on a path towards dramatically reducing our greenhouse gas pollution by 2020, we’ve put in place a robust repertoire of additional laws, programs, and regulations to reach our climate goals. These include cap-and-trade, the system that charges polluters for the pollution they generate. In addition, California is implementing strategies that reduce gas and diesel use in cars and trucks by up to half; increase our electricity derived from renewable sources from one-third to 50 percent; double the energy efficiency savings at existing buildings and making heating fuels cleaner; reduce the release of methane, black carbon, and other short-lived climate pollutants; manage farms, rangelands, forests, and wetlands so they can store carbon; and periodically update “Safeguarding California,” the state’s climate adaptation strategy. That said, we know transitioning to a clean energy future will need a lot of resources, especially in the least resourced communities, so we can’t completely ignore that side of the conversation. Pricing carbon at high levels to discourage the use of fossil fuels makes a difference, but we shouldn’t think of it as a revenue-generating strategy, but as a pollution reduction strategy. Now for information in the report. 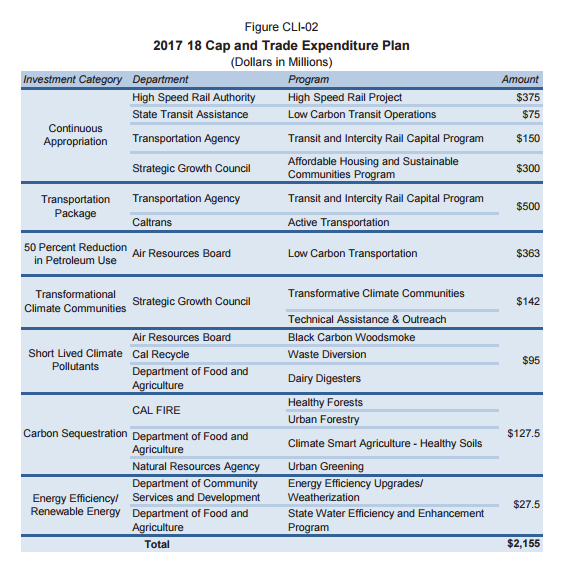 As the chart below indicates, the legislature has appropriated over $3 billion to various agencies implementing programs that reduce greenhouse gases, but the report only provides concrete outcomes from $1.2 billion in projects implemented through November 2016. These have accountable benefits cutting greenhouse gases, helping disadvantaged communities, and more. NUMBER THREE: MORE MONEY IS BENEFITING DISADVANTAGED COMMUNITIES THAN REQUIRED BY SB 535 (DE LEON, 2012). 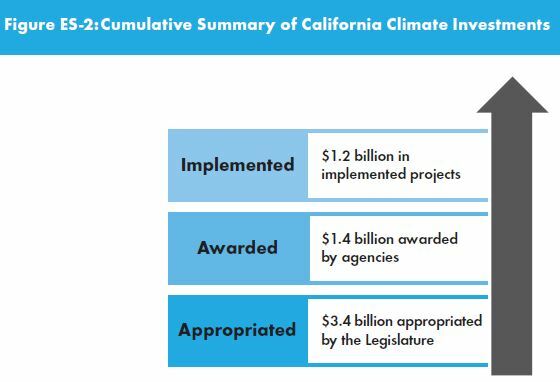 SB 535 requires that at least 25 percent of California Climate Investments go to projects that provide benefits to disadvantaged communities, with at least 10 percent going to projects located directly within and providing benefits to these communities. 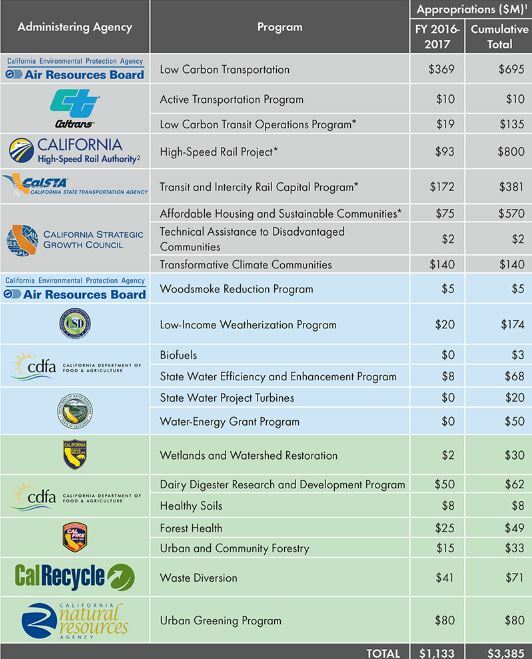 In fact, half the “implemented funds” have gone to projects that benefit disadvantaged communities and 34% of the funds went to projects located in disadvantaged communities — great news for California’s fight against poverty and pollution. NUMBER FOUR: 14 PROGRAMS REPORT AT LEAST 50% OF THEIR INVESTMENTS QUALIFY AS BEING IN DISADVANTAGED COMMUNITIES, WITH FOUR PROGRAMS REPORTING THAT ALL OF THEIR INVESTMENTS ARE LOCATED IN DISADVANTAGED COMMUNITIES. COMBINED THEY REPRESENT APPROXIMATELY $377 MILLION. 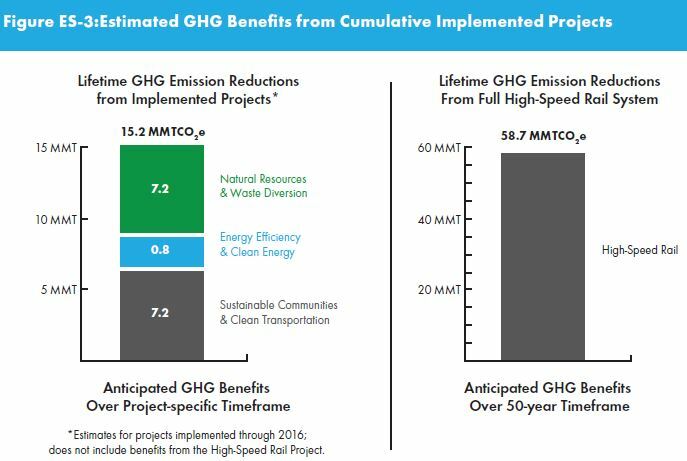 NUMBER FIVE: IMPLEMENTED PROJECTS ($1.2 BILLION) WILL REDUCE GREENHOUSE GASES BY OVER 15 MILLION METRIC TONS OF CARBON DIOXIDE EQUIVALENT (MTCO2E). NUMBER SIX: 97% OF THE STATE’S DISADVANTAGED COMMUNITY CENSUS TRACTS ALREADY HAVE PROJECTS FUNDED BY CALIFORNIA CLIMATE INVESTMENTS. While not all disadvantaged communities have received the same level of investment, the fact that only 3% of disadvantaged community census tracts have not received any climate investments is impressive. Of course, we need to further analyze how benefit is measured and ensure that disadvantaged communities experience maximum benefit, but that is for another time. 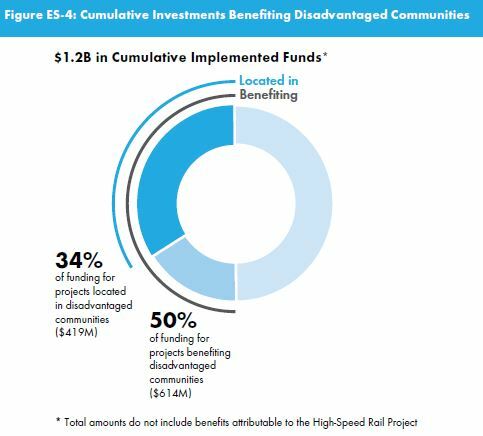 NUMBER SEVEN: $900 MILLION IN IMPLEMENTED FUNDS (NOT INCLUDING HIGH-SPEED RAIL) HAVE ATTRACTED OVER $4.5 BILLION FROM OTHER SOURCES, LEVERAGING MORE THAN $5 FOR EVERY DOLLAR INVESTED. NUMBER EIGHT: THE GOVERNOR PROPOSES TO ALLOCATE $2.2 BILLION FOR GGRF PROGRAMS FOR FY 2017-18, BUT THE PATH FORWARD IS MURKY. Two main issues complicate things. First, the governor made the allocation of funds contingent on the extension and approval of cap-and-trade by two thirds of the legislature. That’s difficult under any circumstances, but when the issue is as contentious as cap-and-trade it feels daunting. Second, for the first time in the program’s history the governor’s GGRF budget proposal anticipated revenues collected in auctions this year. In the past the budget proposal was crafted with revenue already in the coffers. With the most recent auction generating significantly less revenue than expected, it remains unclear how much revenue CA will have to allocate to GGRF. It will probably fall far below $2.2 billion. NUMBER NINE: NEW LEGISLATION AND PROGRAMS WILL IMPROVE DISADVANTAGED COMMUNITY OUTCOMES. In September 2016, the legislature passed and the governor signed new legislation that updates implementation of the GGRF. AB 1550 increases the SB 535 disadvantaged community investment minimums from 10% to 25% targeted for projects located in disadvantaged communities. The law also creates a new 10% targeted investment minimum to low-income communities and households. AB 2722 creates the new Transformative Climate Communities Program , administered by the Strategic Growth Council. This program will fund the implementation of neighborhood-level transformative climate projects that provide local economic, environmental, and health benefits to disadvantaged communities. NUMBER TEN: THE ANNUAL REPORT STILL LACKS INFORMATION ON CO-BENEFITS – THAT IS, BENEFITS IN ADDITION TO GREENHOUSE GAS REDUCTIONS. In 2016, ARB contracted with UC Berkeley to research and evaluate potential quantification methods for a limited number of co-benefits, prioritizing benefits most broadly applicable across GGRF programs, and those with interest from multiple agencies and stakeholders, like job creation and local air quality. We’re disappointed that it will take at least several more years until we have this information, but we will continue to push for it in all of California’s climate programs. BONUS: ARB LAUNCHED A ONE-STOP SHOP FOR CLIMATE INVESTMENTS INFORMATION ON THE WEB. It’s cool. It could be better.